Duccio di Buoninsegna (Italian: [ˈduttʃo di ˌbwɔninˈseɲɲa]; c. 1255–1260 – c. 1318–1319) was an Italian painter active in Siena, Tuscany, in the late 13th and early 14th century. He was hired throughout his life to complete many important works in government and religious buildings around Italy. 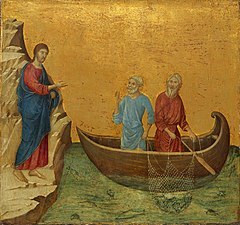 Duccio is credited with creating the painting styles of Trecento and the Sienese school, and also contributed significantly to the Sienese Gothic style. Although much is still unconfirmed about Duccio and his life, there is more documentation of him and his life than of other Italian painters of his time. It is known that he was born and died in the city of Siena, and was also mostly active in the surrounding region of Tuscany. Other details of his early life and family are as uncertain, as much else in his history. One avenue to reconstructing Duccio's biography are the traces of him in archives that list when he ran up debts or incurred fines. Some records say he was married with 7 children. The relative abundance of archival mentions has led historians to believe that he had difficulties managing his life and his money. Another route to filling in Duccio's biography are by analyzing the works that can be attributed to him with certainty. Information can be obtained by analyzing his style, the date and location of the works, and more. Due to gaps where Duccio's name goes unmentioned in the Sienese records for years at a time, scholars speculate he may have traveled to Paris, Assisi and Rome. Nevertheless, his artistic talents were enough to overshadow his lack of organization as a citizen, and he became famous in his own lifetime. In the 14th century Duccio became one of the most favored and radical painters in Siena. The Calling of the Apostles Peter and Andrew (from the Maestà), c. 1308-1311. Where Duccio studied, and with whom, is still a matter of great debate, but by analyzing his style and technique art historians have been able to limit the field. Many believe that he studied under Cimabue, while others think that maybe he had actually traveled to Constantinople himself and learned directly from a Byzantine master. Little is known of his painting career prior to 1278, when at the age of 23 he is recorded as having painted twelve account book cases. Although Duccio was active from 1268 to about 1311 only approximately 13 of his works survive today. Of Duccio's surviving works, only two can be definitively dated. Both were major public commissions: the "Rucellai Madonna" (Galleria degli Uffizi), commissioned in April 1285 by the Compagnia del Laudesi di Maria Vergine for a chapel in Santa Maria Novella in Florence; and the Maestà commissioned for the high altar of Siena Cathedral in 1308, which Duccio completed by June 1311. Duccio's known works are on wood panel, painted in egg tempera and embellished with gold leaf. Differently from his contemporaries and artists before him, Duccio was a master of tempera and managed to conquer the medium with delicacy and precision. There is no clear evidence that Duccio painted frescoes. Duccio's style was similar to Byzantine art in some ways, with its gold backgrounds and familiar religious scenes, however it was also different and more experimental. Duccio began to break down the sharp lines of Byzantine art, and soften the figures. He used modeling (playing with light and dark colors) to reveal the figures underneath the heavy drapery; hands, faces, and feet became more rounded and three-dimensional. Duccio's paintings are inviting and warm with color. His pieces consisted of many delicate details and were sometimes inlaid with jewels or ornamental fabrics. Duccio was also noted for his complex organization of space. He organized his characters specifically and purposefully. In his "Rucellai Madonna" (c. 1285) the viewer can see all of these qualities at play. Duccio was also one of the first painters to put figures in architectural settings, as he began to explore and investigate depth and space. He also had a refined attention to emotion not seen in other painters at this time. The characters interact tenderly with each other; it is no longer Christ and the Virgin, it is mother and child. He flirts with naturalism, but his paintings are still awe inspiring. Duccio's figures seem to be otherworldly or heavenly, consisting of beautiful colors, soft hair, gracefulness and fabrics not available to mere humans. He influenced many other painters, most notably Simone Martini, and the brothers Ambrogio and Pietro Lorenzetti. In the course of his life, Duccio had many pupils, even if it is not known if these were true pupils, formed and matured artistically within his workshop, or simply painters who imitated his style. Many of these artists are anonymous, and their connection to Duccio has emerged only from analysis of a body of work with common stylistic traits. The first pupils, whom we can refer to as a group as first-generation followers, were active between about 1290 and 1320 and include the Master of Badia a Isola, the Master of Città di Castello, the Aringhieri Master, the Master of the Collazioni dei Santi Padri and the Master of San Polo in Rosso. Another group of followers, who could be termed followers of the second generation, were active between about 1300 and 1335 and include Segna di Bonaventura, Ugolino di Nerio, the Master of the Gondi Maestà, the Master of Monte Oliveto and the Master of Monterotondo. It should however be said that Segna di Bonaventura was already active prior to 1300, so that he overlaps as to period both the first and second generation of followers. A third group followed Duccio only at a distance of several years after his death, a fact which shows the impact his painting had on Siena and on Tuscany as a whole. The artists of this third group, active between about 1330 and 1350, include Segna di Bonaventura's sons, that is, Niccolò di Segna and Francesco di Segna, and a pupil of Ugolino di Nerio, namely, the Master of Chianciano. Some of these artists were influenced by Duccio alone, to the point of creating a decided affinity or kinship between their works and his. Among these the Master of Badia a Isola, and Ugolino di Nerio, along with Segna di Bonaventura and their sons. Other artists were influenced also by other schools, and these include the Aringhieri Master (think of the massive volumes of Giotto), and the Master of the Gondi Maestà (who shows the influence also of Simone Martini). The case of Simone Martini and Pietro Lorenzetti is somewhat different. These two artists painted works that have affinities with Duccio: for Simone from about 1305, and Pietro from about 1310 onwards. However, from the outset their work showed distinctive individual features, as can be seen in Simone's Madonna and Child no. 583 (1305-1310) and in Pietro's Orsini Triptych, painted at Assisi (about 1310-1315). Later the two developed styles with completely independent characteristics such that they acquired an artistic standing that elevates them well beyond being labelled simply as followers of Duccio. Madonna with Child, c. 1300-1305. What's the good word on Duccio?